Occasionally you read a pithy description of a piece in a program and immediately have an idea of how the piece might sound. As the piece begins, however, it takes you places you couldn’t have imagined. Your two-dimensional expectation becomes a teeming microcosm, a city unto itself. Like a poem, the architecture of the piece defies paraphrase. This was the impression I had listening to Unsuk Chin’s Graffiti performed by the Melbourne Symphony Orchestra under the baton of Robert Spano. Graffiti opens with strings scrubbing near the bridge, a play (despite the composer’s claim that the piece is neither illustrative nor programmatic) on the origin of graffiti in messages “scratched” into the walls of ancient cities. This lone scratching expands into a scurrying chorus, depicting the “Palimpsest” of the movement’s title. I would say that the piece is not only illustrative (if any music is), that it is just as enjoyable without any program. The second movement, “Notturno Urbano,” manages to be both spacious and grotesque thanks to a plethora of extended woodwind techniques that deftly escape cliché, while the epic “Urban Passacaglia” is an immersive journey firmly held together by Spano. If you are going to do something, do it well. This might the be ethos of the young Perth-based composer Alex Turley. When I first met Turley at the 2015 Tura Totally Huge New Music Festival, he told me he wrote unapologetically pretty music. This year he brings his refined sense of texture and atmosphere to the Metropolis New Music Festival as one of the three finalists of the Cybec 21st Century Australian Composers Program. His piece, City of Ghosts, depicts a city shrouded in mist, devoid of people. Modal melodies arise from a subtly-thunderous bed of pianissimo tuba and double bass. The melodies move wraith-like across the ensemble, describing towering buildings and arches. With its profound palette, City of Ghosts is testament to Turley’s musical imagination and honed talents as an orchestrator. Michael Daugherty’s Sunset Strip depicts a drive down Sunset Strip from downtown Los Angeles to the Pacific Ocean. It is also a journey in time, evoking the sounds of “swank restaurants, private eye offices, tattoo parlours, Mexican restaurants, motor inns, discos, bilboards, parking lots, gas stations, burlesque halls, piano bars and jazz lounges.” As with so much music from Daugherty’s generation, I wonder how the next generation will hear it. As conflict breaks out over resources and oceans rise, will they hear in Sunset Strip a metropolis teeming with cultural activity, or an engine of environmental destruction? The piece is, after all, literally a homage to a road. So far Metropolis has explored the theme of “the city” through urban music, ancient and sacred cities, and architecture. All nice, creative approaches to the theme. With Press, Play’s program Crashing Through Fences, Metropolis got political. And it is high time, too, since whether we like it or not (mostly not) we are in the middle of an election campaign through which we decide what our society—and cities—will look like. Will they be divided into gated communities and slums or will we stop widening the gap between the rich and everyone else? Will we invest in services that will reduce homelessness? Will the roads be choked by car fumes or will public transport decongest arterial motorways? Will parts of the city be under water in half a century? The poet Sean Whelan joined pianist Sonya Lifschitz and flautist Lina Andonovska to show that politics can be as appropriate a subtext to a contemporary music concert as ancient architraves and turntabling. Whelan’s laconic, Melbourne-inspired poems heightened the concert’s political relevance by stealth. I assume they were written for this occasion as they were read for the first time in this concert. Icon describes the city covering the natural vegetation, a perfect preface to Steve Reich’s pastoral Vermont Counterpoint. Andonovska highlighted the piece’s twittering and popping textures while deftly swapping between flutes of different sizes. Whelan’s Shadow described the memories intermingling behind our backs before the fluid rhythms of Erik Griswold’s In Patterns of Shade took us on their dappled journey. With Other People’s Houses Whelan approaches the lived reality of cities more directly and intimately. He speaks of a home that “knows too much,” this time accompanied by the mysterious swirling flute of Timo Andres’ Crashing Through Fences. Lifschitz retook the stage alone for three “City Portraits” by Robert Davidson. Each portrait is based on the speech patterns of a figure who has shaped our urban environment. “Free Architecture” uses Frank Lloyd Wright’s interview with Mike Wallace. Wright’s vision of “an architecture that would be a grace to its landscape not a disgrace” is reflected in Walter Burley Griffin’s original and much-departed-from designs for Canberra. “Not Now, Not Ever” is a piano arrangement of Davidson’s famous choral arrangement of Julia Gillard’s even more famous “misogyny speech,” a speech that for one glorious moment crushed the persistent, casual misogyny that is so often tolerated in silence beneath a mighty, righteous fist. In the third “City Portrait” a voice says “I am a young man of 71 years old, I built my first house when I was 17 1/2.” It is particularly affecting that we do not have an image of the speaker this time. Who is this man? He describes himself as a poet “working with my eyes and hands,” venturing into nature, speaking from “the heart of man.” Footage of children playing in a park flickers past as he describes his dream of “sun, space and green” for all. But to have sun, space, and green, the voice tells us, 2000 people must live together joined by a single vertical road. It is the voice of Le Corbusier, the modernist architect who we have to thank for every reinforced concrete tenement built after the Second World War. But when described in his voice and accompanied by Davidson’s expansive piano, played with Lifschitz’s commitment and sensitivity, one begins to understand his utopian vision. Against this bitter-sweet piano part we see his buildings torn down like so many democratic post-war innovations. The image of thousands of people coexisting in neat blocks is given musical form in Beat Furrer’s Presto con Fuoco. The motoric flute and piano parts interlock precisely, filling each other’s silences. Bent at the knees, ready to spring at the dense score, Andonovska’s charged, athletic performance keeps the entire audience on the edge of their seats. Politics being out of the bag, Whelan’s When Everything Falls likens shopping to looting and criticises our diminishing sense of value in a world where anything can be bought. He imagines climbing Eureka tower and breaking a window, only to turn away from the “best view of Melbourne” to the face of his lover. After this, the amplified Sigur Rós-like chords of Chris Cerrone’s Hoyt-Schermerhorn are a devastating love song. Whelan’s final poem Don’t Break My Sky poetically lists elements of our society that unpoetically slap us in the face every day: Draconian immigration policies, $6000 toasters, “the orange-tinted supervillain of the US Presidential primaries,” and so on. Confronted with all this Whelan says we “turn inward, turn outward,” and crash on through. It is so easy to switch off from politics when it is presented to us as a stream of unrelenting point-scoring imbecility. But a powerful program by these incredible artists is just enough to make you care again. Ensemble Offspring, photo courtesy of the artists. 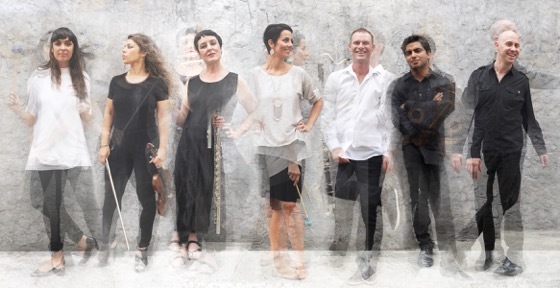 Sydney-based new music group Ensemble Offspring continue the Metropolis festival with a colourful series of works for live ensemble and video. Their programme Light is Calling began with a great example of a minimalist work that uses less to achieve more. Light is Calling for solo violin, electronics, and video is an attempt to “make something beautiful” after the ugliness of the attacks on the World Trade Center on September 11, 2001. Composer Michael Gordon provides a slow-moving violin part, devastatingly interpreted by Ensemble Offspring’s Veronique Serret. Reverberant and reversed samples form a finely-textured bed of electronic sound. Film maker Bill Morrison, who also contributed to Julia Wolfe’s Fuel in the MSO’s second Metropolis program, brings the piece to new emotional heights. Morrison’s film consists of a reprint of footage from the black and white 1926 movie The Bells. Morrison melts film footage of figures, faces and horses to produce hauntingly distorted images. As the film turns to yellow, brown, and black, the images smear and stretch across the screen. The echoing electronic part, lamenting violin and immolating film all seem mourn a long-lost innocence. Nico Muhly’s It Goes Without Saying combines live clarinet (Jason Noble) with prerecorded metallic sounds including a kitchen whisk, bells and harmonium. The delicate sound world also includes pre-recorded clarinets that duet playfully with the live performer. The piece is accompanied by a video of stop-motion hair clippings on a white background. The hair slowly coalesces into a face, setting in motion a series of vivid animations including soap suds and metallic shards. Noble transfixed the audience with the hypnotic clarinet part. This was especially strong during the opening abstraction of drifting hair follicles. Ensemble Offspring’s Metropolis programme included the world première of audiovisual artist Chris Perren’s Dive Process. In Dive Process, Perren builds on his recent experiments with musical and video phasing. Dive Process uses a retro video of a girl diving into water. The video is reversed and replayed at her point of entry into the pool, creating a rhythmic explosion and contraction of bubbles. Three versions of this film are then played side by side at different rates in a mesmerising phasing pattern. Perren’s score for percussion, clarinet, and violin mirrors the visual phasing pattern. Perren builds the intensity of this pattern during segments where dozens of copies of the video are spaced around a sphere. Continuing the theme of rhythmic counterpoint, the ensemble then played Steve Reich’s Vermont Counterpoint, a sister-piece to Reich’s Six Pianos, which Zubin Kanga performed in an arrangement by Vincent Corver earlier in the festival. Ensemble Offspring reserved the second half of the concert for Damien Ricketson’s magnificent Fractured Again Suite. For this large-scale chamber ensemble work, Ricketson draws inspiration from the physical properties and sound of glass. In particular, Ricketson singles out the glass harmonium, a relatively popular instrument in the eighteenth century that has since fallen into obscurity. The closest thing one can hear to its ethereal tone nowadays is a dextrous performance on a row of tuned wineglasses. Ricketson builds the Fractured Again Suite out of fragments of compositions for the glass harmonium by Mozart, Donizetti and others. These fragments are then reflected, distorted and splintered like glass to form the arresting and sparkling surface of the suite. The rapid opening resembles an off-kilter clockwork automaton racing towards self-destruction. The glass-inspired video accompanying the work includes a brilliant array of coloured lights projected upon tubes, panes, and rods of glass. Some of these lights are reflected in repetitive, rhythmic ways, while at others they resemble the more timbral reflections of the piece’s later movements. Michael Gordon, Light is Calling; Nico Muhly, It Goes Without Saying; Chris Perren, Dive Process; Steve Reich, Vermont Counterpoint; Damien Ricketson, Fractured Again Suite. Zubin Kanga. Image courtesy of the artist. Zubin Kanga always drags half a dozen new works in his wake as he criss-crosses the globe in search of the bleeding edge of piano repertoire. Kanga’s last tour of Australia entitled “Piano: Inside/Out” explored the inside of the piano, either through playing the piano strings directly with the hands or by preparing the strings with objects like paper and Blu-Tac to change their tone. In his current “Dark Twin” tour, Kanga extends the piano outward through live electroacoustic manipulation and video projections. Premièring new music necessarily runs the risk of performing a “bad” or “unsatisfactory” work. Saying that a work is “beautiful,” “successful,” or that it “works” would be meaningless if the reverse were not possible. Composers are often their best critics and will revise works after a first hearing. Andrew Ford’s recent book Earth Dances tells of how Stravinsky struggled to find a satisfactory ending to The Rite of Spring. On the other hand—to continue the Rite example—audiences and critics have often failed to appreciate how a work is beautiful or successful upon first hearing. Knowledge of the multiplicity of ways in which a piece can be “good” is perhaps the reason why critics can shy away from negative judgements. However, I feel particularly emboldened to make critical judgements this morning because George Brandis has just funneled $104.8m away from the peer-review-based Australia Council for the Arts and into his own ministry, where who knows what sort of evaluation process will take place. Consider this review a battle-cry for judgment over cronyism. In this review, the success of a work is judged according to how well it achieves what the composer or performer set out to do in writing and performing it. I will try to bring other qualities of the works to light as well, in spite of the creators’ stated intentions. In Stefan Prins’ Piano Hero, Kanga plays a MIDI keyboard that triggers video samples of a man playing with his hands on a stripped-back piano frame. The minimal gestures of the keyboardist contrast with the full-body movements of his avatar in the video, who strums and strikes the strings. The avatar also uses subtler gestures, including conjuring a smooth tone from the body of the piano with a cork on the end of a stick. He bounces and throws a handful of piano keys onto the strings, scattering them across the frame. According to Kanga’s programme notes, the work seeks to “explore the modern trend of the virtual replacing the real while deconstructing the relationship between pianist, instrument and observer.” The work achieves the first of these goals, while leaving the second in the air. The starkly-lit, beautifully-textured surfaces of the piano frame make the video seem more real than the poorly-lit keyboardist. The avatar’s movements are also more visceral than those of the keyboardist. One of Piano Hero‘s greatest strengths is the compositional use Prins makes of his technical apparatus, whatever its rationale. The piece begins with the keyboardist triggering only the resonance left after the piano strings are struck. The performer’s hands hover above the strings, seemingly conjuring the resonance out of them. As more violent gestures are introduced, with the performer striking the strings, the speed of the gestures are modulated by the MIDI keyboard. This creates striking contrasts as the physical intensity of the performer attacking the strings contrasts with more balletic, slowed-down gestures. At first [the electronic part] matches the pianist closely, but then begins to slide in pitch and distort in colour –techniques that are impossible on a piano. 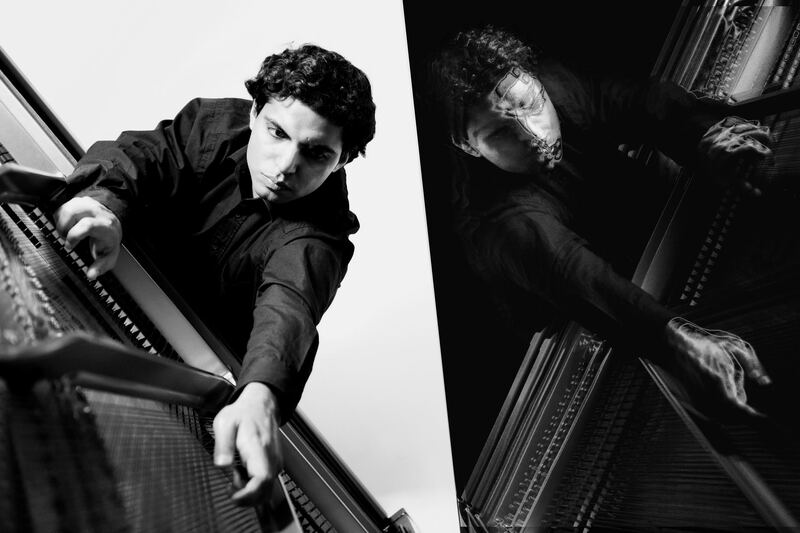 Over the course of the piece, the electronic part shifts from being an indistinguishable electronic ‘twin’ of the pianist to becoming a grotesque rival. The piece begins with the minimalist gesture of two rapidly-alternating notes. At this point, the live part does indeed sound almost indistinguishable from the electronic part. As the piece progresses, the electronic part becomes deeper and seems to spread around the room. The timbre of the electronic part also becomes more distorted. The impression is less a “dark twin” of the piano part than an expansion of the piano part. The two parts are indistinguishable in the muddy and saturated air. Benjamin Carey’s _derivations provides a much more convincing example of a pianist duelling with an electronic other. I have previously reviewed a recording of Carey’s _derivations system and it was a pleasure to see it in action for one of the first performances of the system with a piano. _derivations is a program intended to improvise with a live performer. The program listens to and analyses the performer’s musical gestures. These gestures are stored in a database, drawn upon and manipulated to contrast with or complement the live performer. The program may also respond through several voices or channels at once, even responding to itself. In some ways the program’s responses to Kanga were predictable and gave a sense of balance to the performance. When Kanga played high on the piano, _derivations introduced a bassy hum. When Kanga ran his hands over the piano strings, _derivations turned this sound into a glassy cloud of sonic fragments. I had the impression in this performance, as I did when listening to the recording above, that the system was playing material straight back to Kanga rather than strategically introducing large-scale formal contrasts. It would be nice to hear a longer performance where the system was able to exert more control over the course of an improvisation. As the Fourth Estate is thought to be an element of society ‘outside’ official recognition, here the radios and e-bows (small electromagnets on the strings) act as static sonic barriers, interfering with the mercurial and lively piano part. What a great idea! Unfortunately it was not one that I found represented in the performance. It seemed to me that Kanga’s runs and key-mashing in different registers were more to “get the strings moving” rather than to provide pianistic gestures that the EBows and radios would then corrupt. I cannot say whether this was the result of the specific directions on the graphic score or its interpretation. The EBows and radios then failed to interfere significantly with the sound of the piano. Occasionally one could hear the jangle of an EBow or a radio physically bouncing on the piano strings, but they did not appear to intermingle with or modulate the piano’s sound. Surely the media is not that ineffectual, bouncing along the titanic reverberations of politicians? Now, I am fully aware that I am about to fly to Perth to review the Totally Huge New Music Festival and will no doubt spend a lot of time in the same room with Hope, but this only goes to show how seriously I take reviewing. In Transit by Michel van der Aa, an elderly man fights loneliness through a series of repetitive acts. He struggles to open doors and open the window. He drags a chair back and forth and bottles steam from a kettle that he can barely lift. The noir-like film captures the claustrophobia of physical weakness and the importance of memory. The live piano and electroacoustic parts are integrated into the rhythm of the film. Kanga’s silent movements, such as raising his arms to play, or reaching to one side of the piano but not striking a key, are accompanied by electroacoustic sounds. This gives the impression that Kanga is a magical piano samurai, which is not too far from the truth. Blinkhorn’s FrostbYte: Chalk Outline is an audiovisual piece contrasting pristine Arctic waters with industrial infrastructure. The Chalk Outline of the title refers to the climate change, exacerbated by industrial activity, that is rapidly transforming the landscape. Blinkhorn created the piece with video and audio material he collected while travelling in areas of the Arctic. The musical accompaniment to the footage of the Arctic landscape is fittingly tinkly, high and “icy.” Blinkhorn begins to introduce sounds from dubstep, with wobbly bass and dramatic, booming punctuations as the footage moves to cranes, which are processed through abstract mirroring effects on the video. The stunning video footage was inexplicably processed through a filter that broke it up into beveled windows. It seemed to me that this was unnecessary as the beautiful landscape spoke for itself. Steve Reich’s Six Pianos is difficult to mount due to the problem of gathering six pianos together in the same space and still having room for the audience. Pianist Vincent Corver has opened the door for more (partially) live performances of the work by arranging it for one live pianist and five pre-recorded parts in the retitled work Piano Counterpoint. Kanga performed the live part with bravado and flair. We will no doubt hear this piece many more times in the future. See also Charles MacInnes’ thoughtful review. Stefan Prins, Piano Hero; Julian Day, Dark Twin; Benjamin Carey, _derivations; Michel van der Aa, Transit; Daniel Blinkhorn, FrostbYte: Chalk Outline; Cat Hope, The Fourth Estate; Steve Reich (arr. Vincent Corver), Piano Counterpoint.